We at ECHO appreciate food especially when the ingredients are fresh, simple, and tasteful in preparation. What if you decided that for a week, you were only going to eat the food that you grew yourself? Nothing added. Nothing store-bought. Simply, from farm to table. 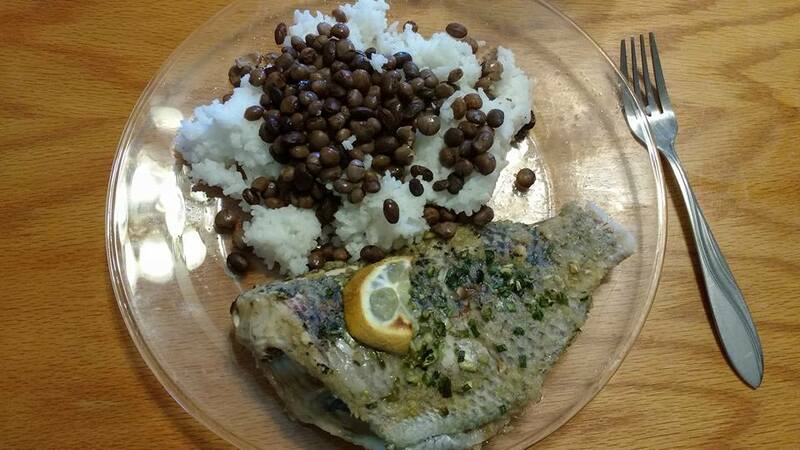 Tilapia with rice and tepary beans. Not even a whole day from farm to table. This week is the annual Farm Challenge. The first week of February is a week of harvesting, eating, and uniquely creating dishes using ingredients only harvested from the farm. As you can imagine, this takes a large amount of creativity, ingenuity, and preparation. Without the incorporation of processed, convenient foods, the harvesting and preparation for a meal is quite time-consuming. Creativity is essential in keeping moral high and appetites quenched. In the past, some edible creations have consisted of: tilapia ceviche, salad with sesame, lime, and peanut sauce, and a papaya grapefruit smoothie. Moringa (a strong source of potassium and iron) is included to keep participants energized and full of vitamins and nutrients. In ECHO's intern program, interns manage our "developing world farming plots" and learn first-hand the variety of foods that exist around the world. These plots demonstrate the different environmental conditions and climates that are experienced (semi-arid, monsoon, etc.). Farm Challenge uniquely connects interns with the crops that they have been growing on the ECHO Global Farm throughout their training time. Using the bounty of small livestock, fruit, vegetables, grains, herbs and spices, interns craft three meals a day. The only external items allowed are salt and oil, both readily available in developing countries all around the world. In preparation, Interns have milled rice, millet, sorghum, pigeon pea, beans and corn; harvested a rabbit and fish; and boiled down sugarcane juice into molasses. These items will act as bases, starches, and protein for dishes and sweeteners for others. What do you think? What's one thing that you couldn't go without?